Welcome to a place where all the world is water and the stage is all the world. Welcome to the turbulent waters of your imagination, the calm of happy memories. Welcome to this uncharted realm. 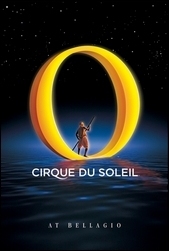 On October 19, 1998, Cirque du Soleil beat the odds an introduced an exciting new production to the world -- «O» At first glance, "O" is nothing more than another Cirque du Soleil production inside a fancy theater built to specifications for a hotel project on the Las Vegas strip. When you take a second glance, "O" becomes much, much more. The mere utterance of the show's title conjurers up a barrage of chaotic images, spectacular performances, and heart wrenching melodies. Every aspect surrounding it is finely tuned; detailed to exactness. It seems inconceivable that within a $1.6 billion dollar hotel resides a production never before attempted. Never before imagined even; until now. 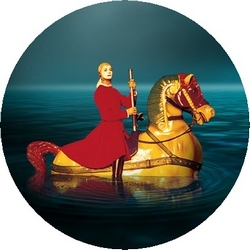 "O" is the brainchild of Franco Dragone and Gilles Ste-Croix, and the title itself, "O" is a phonetic play on "eau" - the French world for water. And the show, like the host resort, drips with it! Set to water in a $70 Million dollar theater, "O" pays tribute to the magic of the theater - from the simplest street performance to the most lavish of operas. Anything is possible. The drama of life plays itself out before your very eyes within a $20 Million dollar production. The fantastic story of "O" centers around an unsuspecting theatre-goer named Giufa - our unwitting guide through this magical realm. When Giufa is chosen to give the show's opening speech, the curtain is suddenly swept away carrying him high up into the air. As his laughter echoes through the theatre, the stage dissolves to reveal an aquatic universe teeming with amphibious creatures and larger than life characters. The incredible adventure has begun. On the other side of the proscenium, Giufa is no longer a mere onlooker, but a witness, a conspirator, an actor in a world that changes constantly before his eyes. While Giufa guides us through "O", each spectator undertakes his or her own odyssey. "O" frees us to lose ourselves in a world without limits - where dreams are not only encouraged, but where they come true. "Secrets of the "O" Curtain"
"New Musical Director for "O"!"